Back before I started blogging in 2008, I read and then wrote an online review of Arthur Brooks’ book Who Really Cares: The Surprising Truth About Compassionate Conservatism. I’m reposting it here with some updates, because I continue to find people citing Brooks’ study as evidence that conservatives are more compassionate than liberals. In short, Brooks’ book is a highly flawed diatribe posing as a rigorous statistical analysis. Anyone who has taken basic social science or statistics should easily be able to see through his poor use of numbers and data, but unfortunately it’s become somewhat of a touchstone anyway. Secondly, although I suspect that a number of the statistical claims Brooks makes may be true (although any beginning statistics course will emphasize that correlation is not the same as causation), they are compromised by other places where he frankly plays fast and loose with the numbers. One of the most egregious examples is his discussion of the estate tax on page 102 (hardcover edition). Brooks cites as proof that taxation hurts charitable giving, the statistic that someone who inherits $20,000 will give an additional $82 to charity; someone who earns that same $20k in the stock market will give $48, and someone who just gets a $20k salary increase will only give another $18. He lets us digest those figures for a few pages, and then on page 113 announces “Even if the estate tax’s demise did redirect donations toward heirs, these would be especially likely to give much of it away.” (emphasis mine). Now, I don’t know about your math, but in my calculations $82 is not MUCH of $20,000. Even if the estate tax were only 10% (and it’s much higher than that), the tax revenue (admittedly not the same as charity) would be $2,000. If “generosity” is defined as giving less than 1% of anything, God preserve us from the stingy folks! Of course, Brooks’ argument here also suffers from the reality that no estate in the U.S. is taxed until it exceeds $5.34 million (it was $2 million when Brooks wrote the book), so that $20,000 differential he’s talking about is on top of a bigger chunk of change than most Americans will ever see, but I digress. Yet another fallacy in Brooks’ reasoning is that all giving that is legally defined as “charity” (a term he never actually defines), is in fact motivated in any way by compassion. The vast majority of many religious people’s giving is, I rather suspect, spent on the institutions and facilities that service their religious practice. This is true in every church I’ve ever attended. 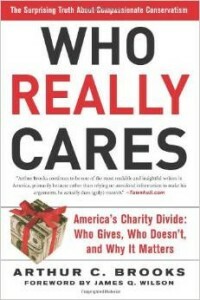 To really get at the question of charity, one would have to analyse giving that is actually directed toward charitable purposes … this is an analysis Brooks does not do.